What? Since Jamal Khashoggi‘s mysterious October 2 disappearance from the Saudi Istanbul consulate, news media have been obsessed with the man. An occasional columnist for a Washington, D.C. newspaper, the Washington Post, Khashoggi wrote articles mildly critical of Saudi Arabia. Yet, that paper has filled its pages with articles covering his disappearance, even to the point of printing a blank column with his name on it. A contact at al-Mayadeen TV in D.C. noted that on October 22, the National Press Club had a minute of silence to honor the man. It’s as if no journalist ever disappeared, it’s as if no cleric ever disappeared, it’s as if no activist ever disappeared. 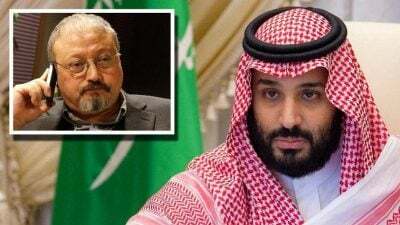 BUT, according to the Lebanese journalist and professor As’ad AbuKhalil, Jamal Khashoggi was a Tame Arab who did the West’s bidding–when writing in English. In Arabic, it was another matter, he said. Khashoggi supported the brutally repressive Saudi Regime, one which a CIA official described to the author as a well-run police state. He was an intimate of Osama bin Laden, breaking off his friendship only when the Saudi government changed its position on the alleged terrorist. He passionately supported the Palestinian Cause, but never on the pages of the Washington Post. Those are only the notable ones. How many more, that we don’t know about, have vanished, have experienced torture, have died? And America? President Donald J. Trump has waffled on what to do. He initially claimed that the Saudis were being pilloried as guilty until proven innocent. Then, he asserted that there would be severe consequences if the Kingdom had killed Khashoggi–without specifying what those might be. Then, he defended substantial U.S. arms sales to the Saudis, claiming that if America didn’t sell weapons to the Saudis, the Russians and Chinese would. The implication was jobs and profits were more important than human rights and human lives. Now that the journalist’s body parts have come to light in the Saudi consul general’s garden, what will Trump and the United States do? Besides dispatching Gina Haspel, CIA Director, to Turkey? What Next? In three weeks, there will be mid-term elections in the United States. In three weeks, President Trump will impose new sanctions on sales of Iranian oil. In three weeks, American gasoline prices may jump substantially. Will Saudi Arabia make up the shortfall in Iranian oil production? Will Saudi Arabia continue to back U.S.-sponsored terrorists in Syria? Will Saudi Arabia continue to buy American weapons for use in Yemen? Not if the Trump Administration ensures that the Kingdom experiences “severe consequences” for murdering Jamal Khashoggi. But what of Mohammad bin Salman? For now, he’s the crown prince. He’s responsible for the order to kill Khashoggi. No, someone else gave the order. He’s not responsible. Saudi youth love him for his interest in their interests. The Saudi people are furious that he makes decisions changing their lives without consulting them. But will he be a survivor? He’s antagonized a lot of well-placed people, notably imprisoning and shaking down more than 200 of his countrymen to root out corruption. He seized more than 1,700 bank accounts. He’s been the driving force for the horrible war in Yemen. It was his idea to begin the Qatar blockade. He’s the man pushing for regime change in Iran. Were the foregoing the cause of reports about an assassination attempt? Certainly, he will have more to answer for if various intelligence services leak details confirming his involvement in Khashoggi’s killing. Why Khashoggi? Why now? Mohammad bin Salman has proved himself to be a loose cannon, catapulting Saudi Arabia to the front pages of most of the world’s newspapers. And not in a good light. He’s cost the Kingdom much good will with his rampaging foreign policy. He’s demonstrated that Saudi Arabia is not a good “ally” of the United States–or Israel. So, is a regime change in the offing? And who is behind it? One knowledgeable Middle East expert has suggested that l’affaire Khashoggi is one way of getting rid of the Crown Prince. It’s not clear yet if it was either the Americas or the Israelis acting alone or in concert. However, tricking Mohammad bin Salman into ordering the journalist’s death, using some of his own security guards to do so, is one way of accomplishing this. Letting the Crown Prince overextend himself, then figuratively pulling the rug out from under him is effective. Adding three weeks’ work of leaks, speculation, and facts only contributess to bin Salman’s end. One possibility might be to replace him with Muhammad bin Nayef, his predecessor as crown prince. He’s a known quantity, having served as Interior Minister. He’s had good relations with the CIA. In the alternative, the current Saudi ambassador to the United States, Khalid bin Salman could take the job. He’s Muhammad bin Salman’s brother and recently returned home for consultations. If and when the Turks release more information, we may get a clearer picture of the Kingdom’s future. Provided Gina Haspel, the Mossad, and Turkish President Erdoğan don’t engineer a “gover-up” in the name of good diplomatic relations. J Michael Springmann is a former U.S. State Department official having served as a diplomat in the Foreign Service with postings in Germany, India, and Saudi Arabia. He previously authored, Visas for Al Qaeda: CIA Handouts That Rocked the World: An Insider’s View recounting his experiences observing officials granting travel visas to unqualified individuals. Additionally, he penned Goodbye, Europe? Hello, Chaos? Merkel’s Migrant Bomb, an analysis of the alien wave sweeping the Continent. He currently practices law in the Washington D.C. Area.